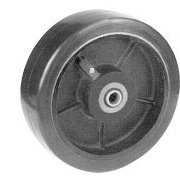 Extra heavy duty polyurethane wheels feature a one inch thick poly tread. This rugged polyurethane tread is chemically and mechanically bonded to a heavy duty cast iron core with a solid web wheel center. Straight roller and tapered roller bearing standard. Note: Tapered roller bearing wheels include thrust spacers; hub lengths shown include thrust spacers. Select from following wheel bearing options for optimum operation of heavy duty polyurethane wheels.